I don't believe in heaven, but if I did, it would involve sleeping in a king sized bed and a lot of swimming. Imagine my absolute delight when a few weekends ago as an early birthday gift, my fella told me to pack a bag with track pants and my swimming stuff, put me in an Uber and handed me an envelope that had a key card to a hotel room. And that's how I got to live out my ultimate dream weekend: a king sized bed, and a lap pool three floors up. The lap pool at the Intercontinental in Yorkville isn't a full 25m, but when you have an entire pool to yourself, and nothing to do except sleep and eat and swim from Friday afternoon to Sunday afternoon, it doesn't much matter. My first swim was Friday night. The pool was empty and perfectly turquoise and the CN Tower lit up every four strokes. When you are used to swimming at the rec centre, dodging all sorts of interesting strokes and various levels of swimming ability, there is something so incredible about finding your own swimming pace. The next morning I was up at the crack of dawn (because I have a toddler and my body won't let me sleep in), but I read the entire paper and drank coffee in bed then put on my suit and the cozy hotel robe and padded down to the elevator for Swim #2 (Not even having to get dressed, and taking an elevator to the pool this positively extraordinary!) The pool was empty once again and I swam and swam until my arms ached. Then I hung out in the sauna and kept reading. Heaven, I tell you! And because my fella is so awesome, and knows me so well, he left swim biscuit supplies in the hotel room, and sushi that I ate post swim, in bed, watching Anne of Green Gables: The Sequel. Swim #3 took place in the window between a post-brunch nap and dinner reservations (again, I had the pool to myself until the last few minutes when three siblings played the most hilarious nonsensical game of tag that reminded me of my sister and I oh-so-many years ago) and I 100% had goggle marks around my eyes for dinner. Swim #4 almost didn't happen because the pool was packed at 9:30am on Sunday (Note: that is prime kid-hotel pool hour! Wait till everyone checks out at 11, or is at lunch around 12!) No 8-year-old wants their handstands interrupted by a lap swimmer no more than this swimmer wants to be weaving around games of frozen tag. I asked for a late check out time and went around 12 at it was blissfully empty once again. My final hotel dip. I swam for longer than I intended because I didn't want it to ever end. The goggle marks didn't have time to fade before my fifth and final swim of the weekend - my fella got me a pass to the new salt water JCC and a print-out of the swim schedule. It was just a hop skip and a jump from "my" hotel pool and they even lent me a lock. Years ago I swam at this pool at 5:30 every morning before my hour and a half commute to work. (I don't know how I pulled that off, especially in the winter!) It was a beautiful pool then (salt water! Best! ), and it's even more beautiful after this newest reno. I wasn't used to dodging other swimmers after my decadent weekend of solo pool time, but it wasn't very busy and it was still a pretty lovely swim with the late afternoon sun filtering in. Near the end of my swim, I broke my own cardinal rule of not talking to swim strangers (because who wants to stand in the shallow end and talk about the weather when there is swimming to be done!) because this elderly gent's goggles were so awesome. They looked like aviator goggles that Amelia Earhart might wear. Turns out they were from the 60s, and this man had worn them ever since. Amazing! Ultimate Swim Weekend complete. It was the most decadent and glorious weekend I have known, one that I will return to for the rest of the winter! The last day of swimming lessons always loomed large. There would be no treading water or long swims, no head-tilt-chin-lifts on the deck, just diving for nickels and gold coins in the deep end and playing frozen tag in the shallow end. All fun and games until the last few moments where you'd stand, shivering on the deck, waiting for the instructor to call your name and hand you your report card, thick with a badge stapled to the inside corner, or crushingly thin if you hadn't passed. It has been years – 20 to be exact – since I passed my last swimming class, and I was surprised to feel that same rush of equal parts excitement and nervousness on Tuesday for my son's final class. Granted, he's not even 2, we only made it to 4 lessons (which, just so we're clear I see as Victory x4) and it took him a while to get comfortable in the water each time, but he did! It was incredible how much his comfort level grew – he jumped in more than once and went all the way under water! He learned to blow bubbles! And kick! Now, when he sees illustrations of pools, he says "I jump!" And when we talk about swimming, he jumps. "Swimming! I jump!" Huge wins. All of them. He might not have gotten an official badge, but he got a badge – a handmade one to go with the one he got last fall – because jumping in and blowing bubbles need to be both commemorated and celebrated! I have a lot of hair – like, when I was dancing, I overdeveloped my neck muscles from holding up my huge pile of hair a lot. And it's long. Which is fine usually except for the 3-4 times a week I try to shove it all in a bathing cap. I can't even count the number of times I've had caps split poolside, or snap back on my forehead leaving behind bright red welts. Until now! I stumbled on a "long hair" swim cap and it has entirely changed my swims. It's silky instead of rip-your-hat-out rubbery and there's room enough for my bun/ponytail without giving me an instant mind-splitting headache (you know the one). NOTE: This is not sponsored, and there might be other long hair caps out there, but this silver Speedo gem is pure long hair swimming heaven. Best $17 I've spent in a long while. Two things I have never swum with: a touque and a hammer. 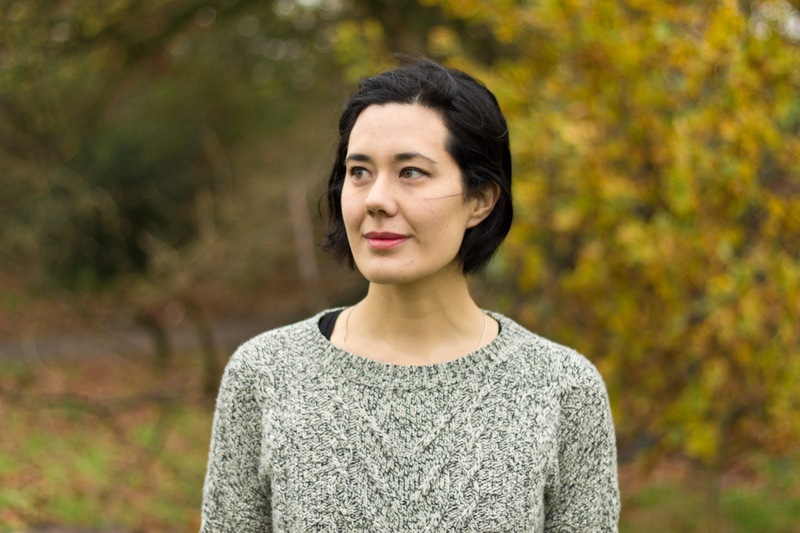 But Canadian-born, Berlin-based Jessica J. Lee swims with both on the regular (WHA!). 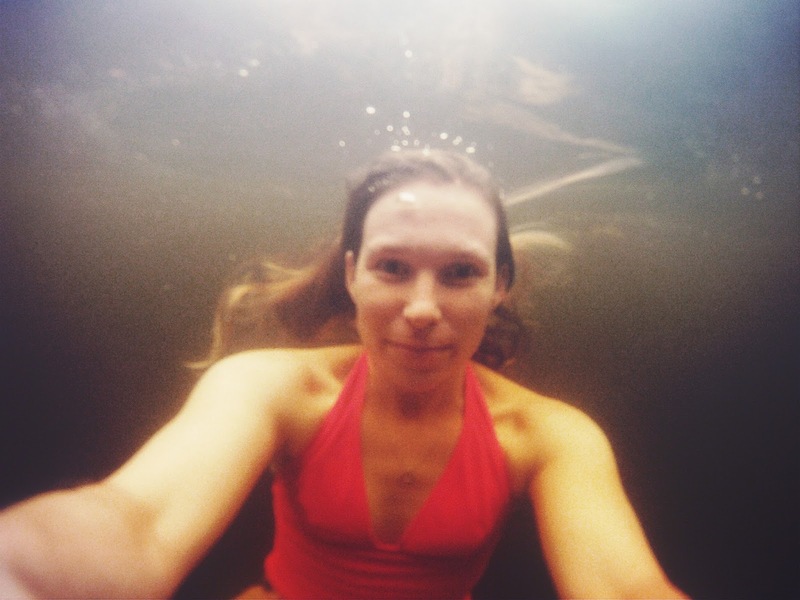 I met this swimmer on Twitter and am so inspired by her Berlin swim-ventures, her winter swimming and her upcoming book, Turning, that charts her swim in 52 swimming holes in and around Berlin. 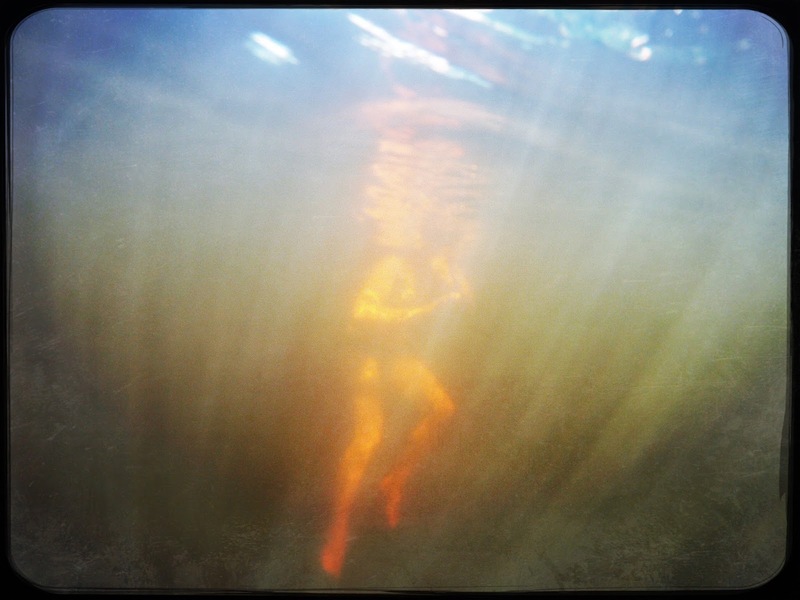 LZV: How did you get into wild swimming? JL: I started swimming in lakes when I lived in Nova Scotia a decade ago – I had been scared of lakes my entire life so it was a big deal to start swimming in them. But I really picked up wild swimming when I was living in London, swimming at the Hampstead Heath Ladies' Pond. It's one of the world's few women's only swim spots, and is the only one in Europe that is open every single day of the year. It is pure magic. LZV: You swim all year round. Outside. (Just typing that gives me goosebumps!) How did you start? Why do you do it?? Do you have any tips/strategies for extra cold swims? How long do you swim for? Do you swim-swim? Front crawl? Breaststroke? Paddle about? JL: I started winter swimming a couple of years ago when I was preparing for my doctoral fieldwork with winter swimmers at the Ladies' Pond. I had always swum a long season, but had never made it through winter until then. I slowly built up by swimming consistently after summer ended. I try to swim a minimum of once a week (ideally three times) and when the temperature really dips (below 8 degrees) I start counting my strokes. The winter is the best part – the way it changes the body, brings you to life. In the depths of winter, if I'm breaking ice (I carry a hammer in winter! ), I'll swim a minimum of 45 strokes. At that point, I'm swimming breaststroke while wearing a wooly toque. It's not so much a workout as it is cold water therapy! LZV: Wild swimming is huge in Europe, but not really here, in Canada. Is it because it's too cold here? Any insights on why? JL: I think the term 'wild swimming' is sort of a funny thing in the Canadian context. In Britain, it has made sense to really 'reclaim' the idea of swimming in lakes, rivers, and the sea, but in Canada we have such an entrenched lake swimming culture, so it doesn't seem like a vital term here. Really, it just means swimming in natural bodies of water/outdoors. In Ontario especially, it's a bit harder to swim through winter—though I've done Great Lakes swims in winter—but on the coasts, winter swimming is definitely happening. LZV: What are the differences between outdoor swimming in London/Berlin/Toronto? JL: I think the big differences is access to lakes and swimming holes. In London, there are really only two decent options within the city itself – the ponds on Hampstead Heath and the Serpentine in Hyde Park. Toronto is also a bit frustrating for this reason – safe access to the lake is so limited to the east end or the Islands. I often find myself trekking across town for a five minute swim in wintertime. In Berlin and the surrounding countryside, there are actually thousands of lakes, so it's possible to swim pretty easily wherever you are. It becomes more a part of everyday life. LZV: What are some of your favourite swimming holes? JL: I love swimming off the dock at my parents' cottage in the Trent Severn Waterway – it's familiar, comforting. The Ladies' Pond on Hampstead Heath – the most beautiful and secluded swims in a lovely community of badass women. And the many lakes of Berlin... my weekly swim is Weisser See, an urban lake in a park, because it's near my house. But I love so many lakes here: sandy, clear lakes like Habermannsee, which was a quarry; forest lakes like Bötzsee; enormous blue swathes of water like Wandlitzsee. There are too many to choose from. LZV: You're writing a swimming book (!!) So amazing and I love the "rules" for your 52 swimming holes: no swimming pools, no wetsuits. All the lakes must be reachable by public transport, bike, or on foot. All must be reasonable distances (i.e. day trips) from central Berlin. I almost can't imagine being able to access so many different lakes from a city centre. What have been some highlights? What has been completely unexpected? JL: Writing Turning was such an extraordinary time for me. I spent an entire year exploring the lakes near my home in Berlin, which allowed me to really begin to feel at home in the landscape here. It's strange, but I know my way around the countryside near Berlin better than anywhere in the world now! The whole process had highs and lows - it was a beautiful, enlivening experience to swim through the seasons, but it also began to grate at some points, when I was tired of trekking out every weekend and just wanted to hide away for winter. I didn't expect to find it as frustrating or emotional as I did. It took a lot of mental wrangling, not least because I was trying to finish my PhD at the same time. But now that it's all done, I feel stronger for it. I think it taught me a lot about how strong I am, and that I can often be a bit too hard on myself (like, say, forcing myself to swim in 52 lakes...). The people here in Berlin and Brandenburg were so encouraging and kind throughout the process, and that really helped. And my German improved a fair bit. The book is out in June in Canada with Hamish Hamilton/Penguin Canada. The UK Outdoor Swimming Society has a great Instagram feed. When I was working on my book I became obsessed with lake science, so I love Sally Warring's Instagram feed, which is mostly microscopic videos of algae. My lovely swim buddy Nell Frizzell wrote a guide to winter swimming for the Guardian a couple years ago. Amy Liptrot's memoir, The Outrun, about recovery and the islands of Orkney feature some beautiful passages on winter swimming. A must read. It feels like the off-season, which is not technically true because there's still quite a bit of swimming happening, but swimming definitely doesn't have the carefree, always-keep-a-suit-in-your-bag-in-case quality of summertime. Now swimming occurs in tiny chlorinated windows that require planning and layers and strategies for not letting your hair freeze on the way home. I'm not complaining, swimming is always glorious whether it's sky overhead, or a cement ceiling, sand underfoot or grotty tiles, but it's definitely a different season for Swimming Holes We Have Known. 1). I read on Twitter that someone dressed their kid up as Penny Oleksiak for Halloween. How amazing is that?! Pure gold. I already made our family costume (that is sadly not swimming related) otherwise *I'd* want to go as Penny! 2). I was chatting this afternoon with my fast lane buddy who I haven't seen since the spring, and after catching up about our best summer swims, he told me about a guy who gets his hair cut by the same barber, who swims to work. IN TORONTO!!! He gets in Lake Ontario at Mimico and swims downtown. Isn't that something!?! If you know of this fella, put me in touch! I'd so love to chat with him! 3). I missed my swim windows for almost 2 weeks and was starting to feel squirrley, but finally made it for a midweek swim this week only to find out that the schedule had changed in my absence and there was only 10 minutes left. Usually I would be so frustrated, but somehow I was just so thrilled to be able to swim, even for 10 minutes, that I enjoyed every second of it. We signed up again in the winter, and were shocked that even though we forgot to register at exactly 7am, we still managed to secure our first choice class time. Turns out no one signs up for swimming lessons in the winter because a) WINTER and b) see A. We got to the first class, which was an enormous feat unto itself, but I got the times wrong and we "swam" for the last 15 minutes of class. And then Jack had a cold, or I had a cold, and then a doctor's appointment, and then it was so cold, and then snow, and then before you know it, we missed every single class, except for those first 15 minutes. Whoops. 1). I bike over. Or I'll drive when it gets too cold. The walk was just too long, lugging bags of towels, snacks, etc. 2). I pack a million towels. Okay, four. One for me, one for him, one for the floor for Jack to stand on and one for good luck. That was we can both be wrapped in towels the minute we get out of the pool so no one hits the I'm-so-cold-I-need-to-scream phase and no one has to stand on the grimy tiles. 4). Jack outgrew his swim diaper, but because I'm really not sure how many times we'll actually make it to the pool, I picked up some disposable swim diapers. I'm usually anti-disposable, but man oh man, they're a game changer on the please-don't-poop-on-the-ride-over-mad-dash to the pool. We'll get him another "permanent" swim diaper for the summer when we're in the water all the time, but for now, we're going with toss aways. 5). Bags! I pack extra tote bags so I can have a bag of his clothes, my clothes, extra towels, etc. Makes the post-swim change way faster. 6). Phone in a ziploc baggie. Too many puddles and wild children to risk a bag-less phone. 7). This is probably common sense, but it's taken me a while to figure out: Pack all the warm clothes. Hoodies, toques, trackpants. It seems like overkill on the way over, but is so welcome on the way home. 11). If your kiddo is in the pre-sitting up phase, change 'em on a bench against a wall so they don't roll off. (Good tip, Kate!) I'd also add corners are the best spots to stick your little one (and use your legs to keep them put while you change). 12). Wear *your* suit to the pool. Totally key. Changing one human is hard enough. (Though does make for a lot of commando trips home, don't forget to BRING YOUR UNDERPANTS!) Good one, Erica! 13). A bumbo. A friend used to bring a bumbo with her to swimming lessons to keep #2 still while wrangling #1. Brilliant as always, Jess! 14). There is a pool in Ottawa that HAS A PACK & PLAY IN THE CHANGE ROOM so you can stick your kid in it while you change. It might be worth moving cities just for that... The changer oom at our local is so wee strollers are banned, but if yours is big enough, it might be worth suggesting to pool management?? There was a mom of an older kid who offered to hold Jack last fall while I changed and I almost wept from her kindness. I have yet to be able to pay it forward, but I'm gonna! Tip: If someone, anyone, ever asks you to show up at a pool before the sun rises, when you'll be the only ones in the water, say yes. Waking up at 4am is never very much fun, but waking up at 4am to drive across the city with one of your swimming besties to see the sun rise over an Olympic pool perched in the sky, and sneaking in stolen lengths in an empty pool, now THAT is fun. It feels like a thousand years ago now, but it was a highlight of the swimmingest summer on record. I'd always wanted to swim at the Donald Summerville Olympic Pool in The Beaches (known to locals as the Olympic Pool, according to the lifeguard/manager who was up before dawn with us), but trekking to the opposite end of the city is tricky with a kiddo. It did not disappoint – there are three (!!) pools perched in the sky, with a view of the lake, the CN Tower, the rumble of Lakeshore traffic. One pool is a diving tank with a huge diving tower at 5m and 10m (my legs quake just remembering them), a smaller square-ish pool in the middle, then a 50m beauty, made even more beautiful under a rising sky. After the thwack and sting of the bellyflopped parts of our bodies had worn off, and the sun was big and bright over the beach, we snuck into the Olympic pool and swam 50m lengths, marvelling at how much longer it felt than the 25m (and sometimes 25 yard!) we're used to. Before this dip I’m not sure I’d ever woken before the sun for a swim or had the chance to stand on the deck of an outdoor Olympic sized pool, with only the company of a dear friend by my side. After our “secret swim,” these are two experiences that I’ll never forget for the rest of my life! I will also never let go of the memory of the sun rising over the lake, while the horizon swelled up with the promise of warmth, letting loose a million crystals to dance across the smooth surface of our sleepy lengths stretched before us. And then there was the jumping in from heights I never thought I would fall from (too many times to count!) I’ll never forget to point my toes again; water can be truly unforgiving! Oh and the wedgies were unreal. We also got to witness a professional diver fall gracefully out of a handstand, from the top diving platform and barely make a splash. It was truly magical. And last but not least there were the lengths Lindsay and I shared at the end our time at the J. Donald D Summerville Olympic Pool. A perfect end to a secret swim. But if Lindsay and I ever have this chance again, we will not wait for the crew to arrive before we jump in. We will break the rules and dive into the morning and never look back. Your race was the 1500m. What drew you to long distance swimming? My best race in the pool was the 1500 and I also swam quite a few Open Water races 10km and 25km marathon stuff. I swam distance because it became quite apparent in my early teenage years that I didn't have natural "speed" and every time I kept swimming distance events I'd have better results... eventually it just became a pride thing, I loved swimming, I loved racing, the best way for me to be "relevant" in terms of the Canadian swim scene was to swim the distance freestyle events. I tried to swim for 2h this summer, but got kicked out after an hour and a half and was astounded by how boring it was. How did you not get so bored? Additionally, what's the longest you've ever swum at one time? I swam some 25km open water races that took the better part of 6 hours... did I get bored? Sure. But my competitive urges were significantly stronger then the momentary boredom. I loved the challenge of the distance stuff, I took pride in doing things other folks would not dare to even try. You used to swim competitively, training for hours every day? Do you miss it? What do you miss? What don't you miss? I swam for 17 years, loved every year, finished with my final season being my best season. Training a lot, it was a major part of the lifestyle. I miss the feeling/the confidence I had in my abilities to do anything in the water. I miss getting to see my best friends (teammates) every day for 2-4 hours a day. And most of all I miss the competitive outlet it gave me in my life, even if the person I was most competitive with was myself most days. I don't miss the constant body ache and the chlorine sweats...they were the worst. What have you taken from your swimming life into your coaching life? The primary thing would be the understanding of the process... what goes into a long and fulfilling swimming journey and knowing it's a marathon and not a sprint. So many families bring their kids to our sport and want immediate results and get incredibly emotionally invested in the early years of their child's development and then the kids end up "burning out" because too much is being asked of them by their parents and their coaches... it's sad and unfair. As a swimmer, I never felt the sport was ever unfair to me so it's important to me as a coach to do all in my power to be fair (which takes on many forms) to my swimmers and their goals. What are some of your favouriting swimming/coaching moments? My favourite swimming moment was probably when I first qualified for Sr. Nationals in the year 2000. I was not a young superstar, I was 20 years old, I wanted to qualify for Olympic Trials, my coach Linda Kiefer was the best guide and mentor I could have ever hoped for to get me there. I was at the CIS Championships at the University of Guelph swimming the 1500FR. There's usually a final lap bell that comes at 1450m of the race but in my race the officials were a little confused and rang the bell at 1350, 1400, and 1500...but not 1450...thankfully my UofT education taught me how to count, I managed the race properly and earned my qualifying cut. What made the situation even more enjoyable is that I was informed by my teammates that Linda was angry and yelling at the officials while they were messing up the counting of the race and at the end of the race Linda had to apologize for being cross at the officials...it meant my swim mattered, it meant she cared, it's symbolic of what makes Linda a great coach to this day. As a coach, my favourite moments come about 3-4 times a year watching kids go an important breakthrough time after putting in the work to earn that swim. It's the best feeling, it makes the year long grind worth it, and then some. What's your favourite advice to give swimmers? I have a favourite diagram I draw for my swimmers about 3 or 4 times a year called 'the Learning Process' and it goes into the 7 different stages that go into achieving goals. If you're looking for more practical advice for ANY swimmer...work on your swimming from the outsides-in. That is, become a better kicker and become more away of what your hands are doing at the top of your stroke. If your hands aren't right at the top of the stroke then they will never be right at any point in the stroke and you will just be reinforcing incorrect habits every time you swim. After training in dance, people often ask me if I now take classes "for fun" but there's no way. It would feel ridiculous to not be able to take classes at the level I was used to. But tons of people do. Do you swim recreationally? I feel 100% the same way you do about dance. I occasionally like to get in the water and move around but I have zero interest in "swimming laps" or swimming in a Masters program. Right now I usually sit around and get a sunburn. I like getting in the water with my sunglasses on, taking a few strokes and fooling myself into thinking the only reason I'm not "swimming" is because I have sunglasses on. The other dorky swim thing I do is I scull my hands in the water a lot and try to fool myself into thinking I still have good "feel" for the water. You married a fellow swimmer! Was your wedding held underwater? If I was in the kind of shape I was when I was a swimmer, I would have been all for that. We had an incredible number of swimming friends at our wedding, we held the wedding at Knox Presbyterian (across the street from the UofT pool), and we held the reception at a venue we would not have known if it were not for swimming... so in a way our swim lives were all around our wedding and in a funny way a large part of our love story. We hold our swimming experiences in a fond place in our hearts. Thanks so much, Dave! You're so inspiring! Dave Ling swam for 17-years with the COBRA swim club, Brock Niagara Aquatics, and the University of Toronto. In recent years Dave has taken on a coaching career that saw him serve 8 successful years at the Toronto Swim Club as an assistant and starting this Fall he has taken over as Head Coach of the St. John's Legends in St. John's, Newfoundland. I have never been so thrilled to see these grotty tiles and worn wooden bench as I was this week. It had been 16 (looooooong!) days since my last swim and there were skylights instead of sky, and the water was so warm it was more bathwater than pool water, but it was still amazing. Back and forth and back and forth. It was exactly where I needed to be. The most incredible part of the swim though was the elderly man who walked onto the pool deck mid-way through the hour. He took slow deliberate steps to the pool deck, limping in a way that suggested he had maybe had a stroke. He slipped into the water, ducked under the lane rope to the fast lane and proceeded to tear up the pool. Full on blazing. He swam circles around all of us. It was incredible. And then I worked and worked and worked all afternoon, my skin still smelling of chlorine. I biked across the city for a meeting with goggle marks still ringing my eyes and biked home in the early dark, and arrived home to mail (YAY!) and if that wasn't exciting enough, it was a pass to one of my favourite pools from one of my new swimming friends, Lindsay of Masters' Swimming fame! Swimming pals are the best pals. Have a good cry in a pile of beautiful pile of fall leaves. Accept the end of summer, move on and prepare yourself emotionally for the long winter months to come. That means, pull out the comfy pants (Hello #TrackPantsClub), stock the pantry with stew ingredients and hot bevies... mmm cider! And have blanket fort supplies always on hand! Let the sad tears fall and then accept the start of snuggle season! Start researching and crafting your INDOOR pool strategy now. Star all the local pools in your neighborhood and start collecting their schedules as soon as possible, so you can have them on hand in a bind. If you are visiting family or friends out of town (and still in a winter climate), research the area before you get there! Be prepared, know the schedules before hand so you can plan some out of town swims! An indoor swim is a great way to mix things up. And there are some amazing swimming complexes all over the place! The winter is a great time to focus on some “slow swimming” aka SPA swimming. A favorite of mine! I’ll be headed to Body Blitz for certain this winter to float around that salt water heaven, smoothie in hand. I’ll also be taking some dips in the tiny cold pools at my other favorite pastime - Sauna-ing. Steamul has an awesome cold dunk pool that you can actually cannon ball into after an insanely hot sauna. And Banya offers a more rustic option… though standing room only (quite shallow). AND spas like the Scandinave have outdoor hot pools that you can relax in during the winter season. It’s a divine experience, except for all the heavily enforced “no talking above a whisper” policies. I, without fail am always shushed at these types of establishments… but the excellent outdoor soak is worth a wee bit of shushing. Obviously this is budget dependent. But if you can swing it, nothing like hitting up an ocean for a week in a far away land. Or you can just do what I did this winter and drool over photos of said oceans on the internet. 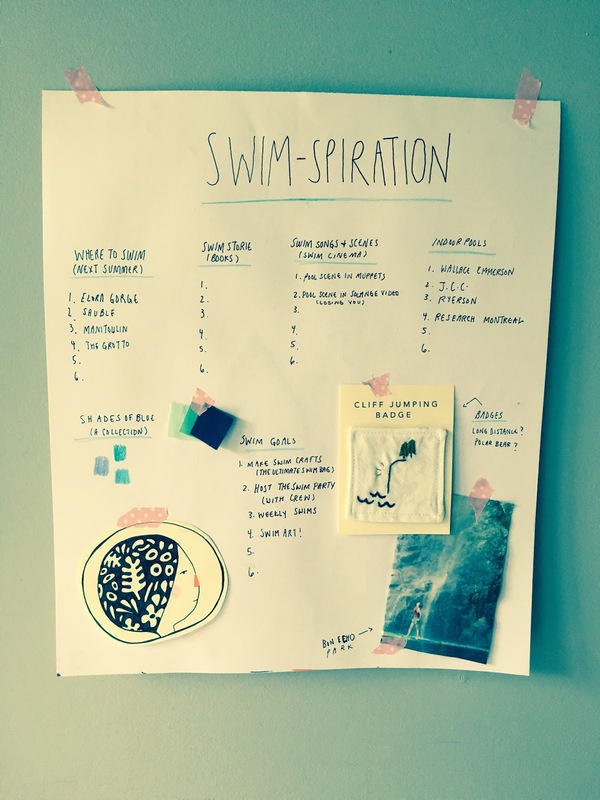 What is a “Swim-spiration” Board? It’s a simple idea, essentially a mood board modified to reflect all things swimming. The idea is to collect anything and everything that makes you happy about swimming and put it together in one place. It could be as simple as a Pinterest board or you could use a cork board. I’ve started one on a big white sheet of paper. To start I’ve been listing places I would love to try swimming next year. Collecting samples of the color blue and making notes on great swimming scenes I see in books and movies. And making notes about swim crafts and badges I may want to achieve over the winter season. Hopefully this tiny list brings some happiness to all of us swimmers out there who are walking past our favorite outdoor pool, now empty and haunted with summer ghosts, or driving by our favorite bodies of water whose warmth is being stolen away from us by the fall winds. Winter does not have to be all that bad. 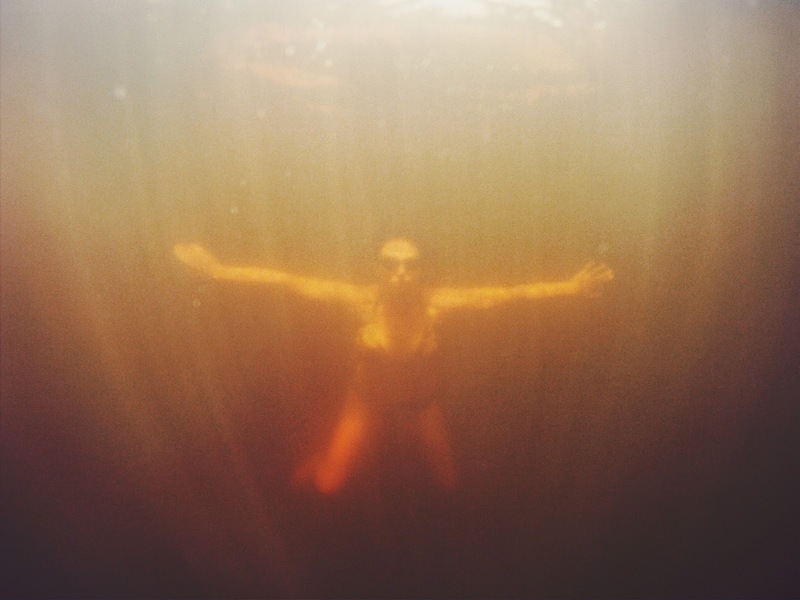 And before you know it… summer swim season will melt before us once again, all full of potential and watery adventures. But for now we hibernate and wait. Who is up for a float? 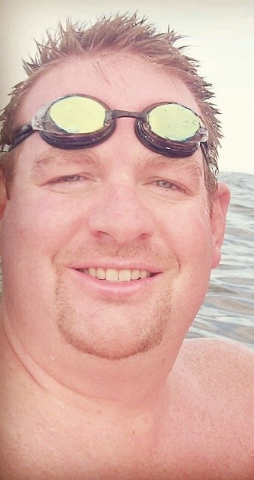 How about a polar bear swim… I’ve thought about it… but not sure I’m ready yet. Head to Iceland, jump in a dry suit and take a dip between two continents! I miss swimming. I type that out and it looks so small on the page, but it feels enormous. I really miss swimming. I miss it so much that I stopped my bike the other day just to watch U of T's swim practice (which of course made the missing worse!) My local is closed until next week and it feels like an eternity. I read something the other day about a swimmer feeling like she's a plant without water when she hasn't swum in a while and I will admit I had the pinpricks of tears in the backs of my eyes, nodding. Yes. Yes. I am a plant without water, a swimmer without water. Melodramatic? Yes. But also true. It's been 12 days since my last swim and I am at a loss. My body feels different, my brain is so cluttered. It's partly because I had such an incredible summer of swimming. It was such a scorcher and I was in the water at least four times a week, if not more. My body has never been so strong. My hair has never been so permanently matted. I explored new pools and stuck with my favourites. The missing peaks on the hot days like today where nothing would be better than a dip, and an hour or so of lengths, back and forth and back and forth, the meditation I crave more than anything else. I've been out walking (my dance-injuried version of running), but it's not the same, even with the sun on my face and podcasts in my ears. I know what I need to do is swim (and I will! Monday! MONDAY! ), but in the meantime, I'll be tweeting with my new UK Twitter chums – Tanya of @lidowriters, a writer-in-residence at the UK's oldest outdoor pool and Clare (@loveswimming) – both swimmers and lido* aficionados (my people!!). They're both going to a lido conference this weekend and man oh man, I wish the teleporter was working! * Lido = pool! I'd never heard the word before this summer - for us non-Brits, it's pronounced lie-do! Labour Day Monday marked the last day for swimming outside in Toronto, and with air show madness down by the water, it almost didn't happen. But I persevered, and on attempt 2, I made it into Sunnyside's beautiful turquoise blue. It was totally packed, deep end to shallow end and every square inch of deck space and it was mayhem in the lane swim area, but it was still such a perfect final dip. - the best swimming-centric family vacation, complete with a playpen on the dock! Fittingly, at the end of my dip, my favourite beach towel, the one I've had since 1998 when I was lifeguarding indoors (worst! ), tore. Sob. And now the pools are closed for the season (except for a few hours a day at Alex Duff pool! ), and I will have to relive this glorious summer in turquoise photos and scraps of float-y poems I've penned on the edge of pools and lakes and rivers. One of the wonderful things that has emerged from my participation in our swim blog is that it has forced me to stop and think about one of my favorite things, water. Pool water (chlorinated) - Sharp and clean, a hard water to cut through with hands pointed and with purpose. Lake water - Alive and rich, broad surface begging to be broken by dock side dives, or to be delicately navigated across while floating with arms stretched wide. 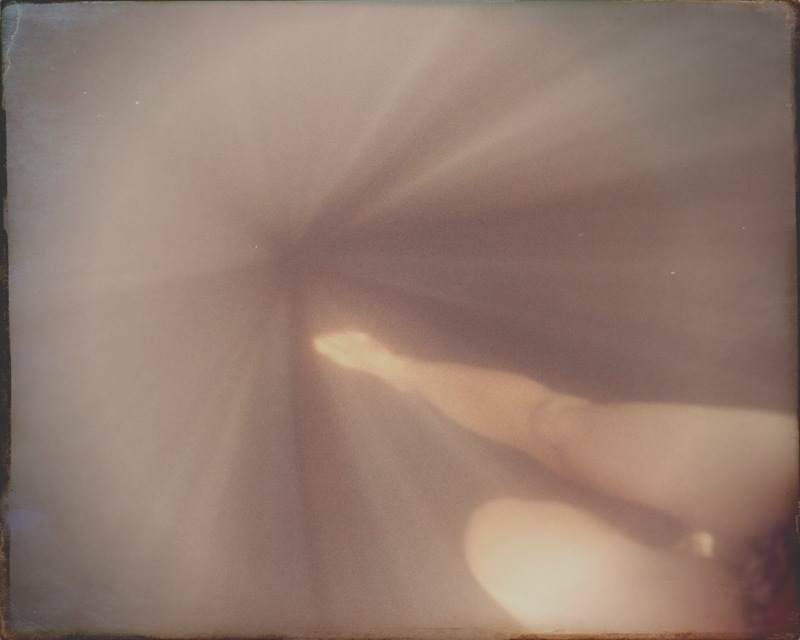 Pond water - Earthy and slow, a thickness I like to not think about too deeply. Salt Water - Light, tacky, and a bittersweet sting to the eyes. This is a very generalized list, each different swimming hole has it’s own unique profile, which brings me to my main focus of the this swim story, The Gatineau River! On our swimming road trip earlier this summer one of the main purposes of the adventure was to spend a good amount of time immersed in the Gatineau. And I have to say it was worth every kilometer we traveled. My first swim in the river was at the tail end of dusk, with night falling fast. We all jumped in at once, holding hands, because that is what you do when you are grown a#$ women who love to swim. The minute I hit the water the first feeling that came flooding my way was… I’m covered in silk! Yes, silk! A deep, dark, silky black pool of water. It was night, so of course the water was black, but it felt extra dark, like black hole dark! 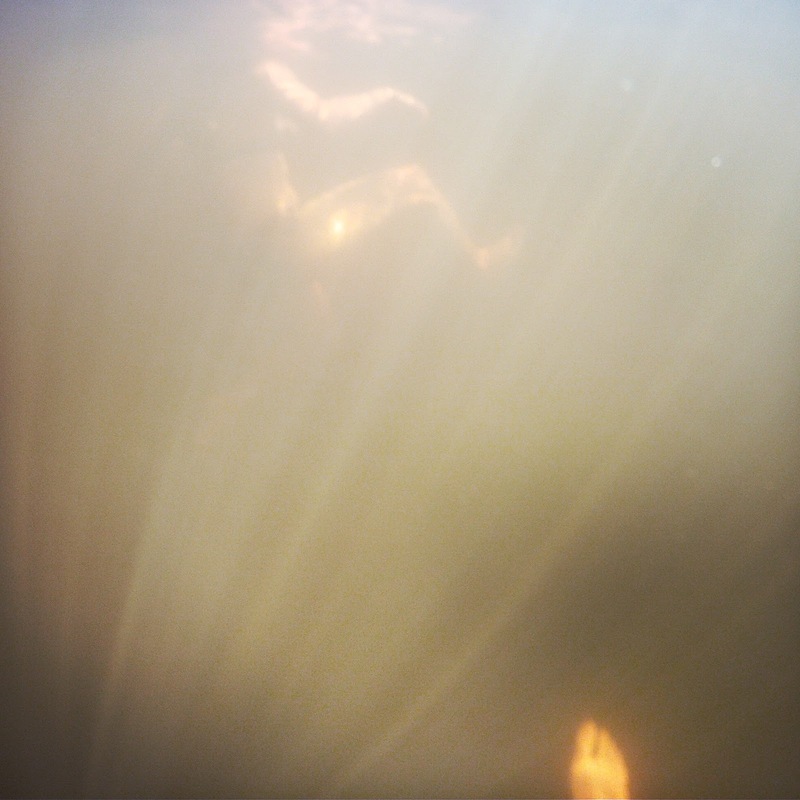 I felt as though I was being swallowed up when I opened my eyes underwater. I felt everything and nothing all at once. It was right and good. I remarked on the silkiness of the water out loud and our fantastic host and resident Gatineau expert Patrice, let me know that I was not imagining it, that in fact the Gatineau River is actually a particular type of river, a blackwater river! Turns out there are all these different types of river water like whitewater, or clearwater and just plain old black mud river water! Patrice also explained that the Gatineau was used as a logging river for years and logs would often sink to the bottom, and that was where the tannins heavy water developed. Which of course made me think of the classic Log Driver’s Waltz animation, because all Canadian children of the 80s know this film, and it’s still a must see in my opinion! The next day there as more swimming, or really more jumping. And I got to see the blackwater more closely in the daylight. It was still incredibly dark! 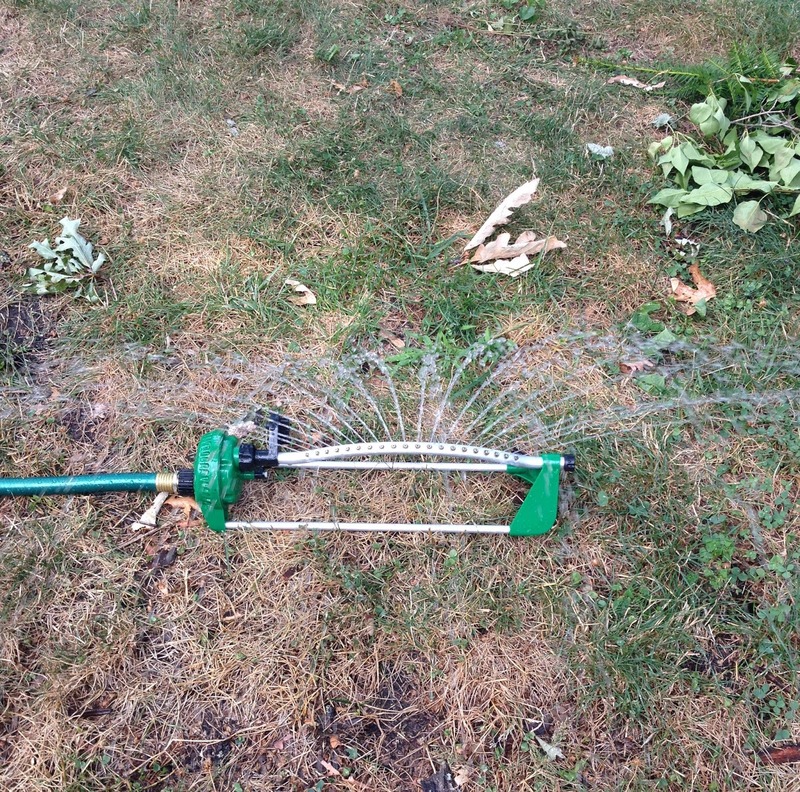 You could barely seen your toes looking down while tredding water! Incredible! Later that evening we went skinny dipping, because guys, that water feels like SILK! I know I’ve already said it a million times! But I had to feel it once against naked skin, and it was amazing. On our final day, I pulled out the GoPro loaned to me by my brother. A tiny technological dinosaur now, compared to newer models. No viewfinder and low low res. 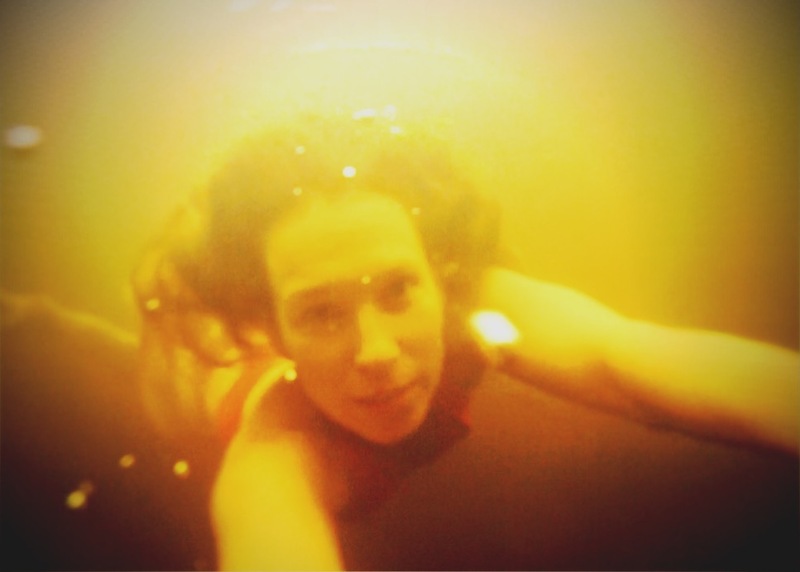 But it was apparently waterproof and I was dying to try taking photos underwater! The photos in this post are the result of that sunny day photo shoot. They are haunting and surreal and I love them all! 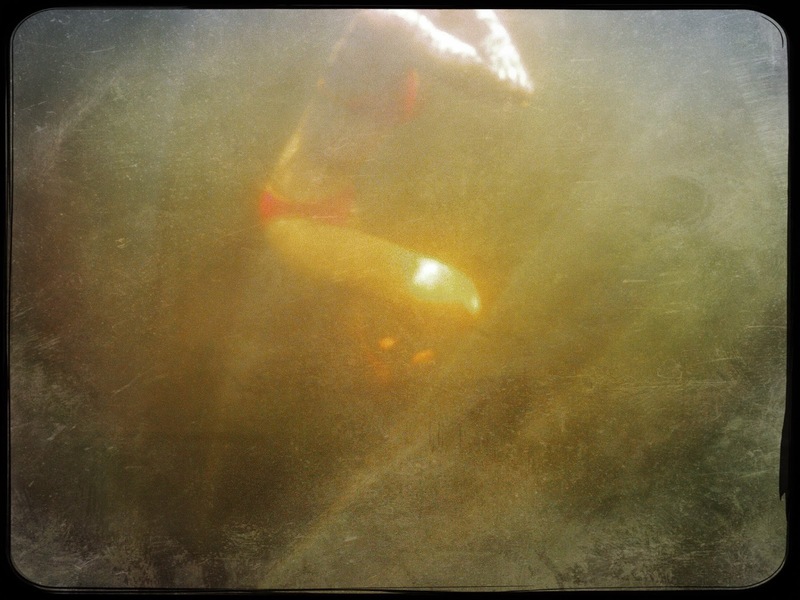 And they almost capture the mysterious and decadent swims we had that weekend. Almost. My memories though, have these moments locked up safe in my watery heart for life. Bonus note, turns out I have been swimming in tannin rich waters once before at a most wonderful Shebeshekong Bay, and it too possesses the same silky texture, though maybe not as dark. Either swimming hole though, is a win! - Laura Queen of the Docktail's Swimming Sommelier Badge (featuring a perfect vinho verde, a boozy watermelon rosemary lemonade, an aperol spritz and an epic red). And I couldn't let our epic Swimming Holes We Have Known collective cliff jump go unrecognized! CLIFF JUMPING BADGES FOR ALL! Check out last summer's badges here! * please note the French knot shrimp. THEY KILL ME!! Where did you swim: I swim at the Athletic Complex at University of Toronto, in the Olympic sized pool. Do you swim here often? How did you first learn about this swimming hole? I've been coming to the U of T pool since I was 13 years old - I used to train with Ajax Aquatic Club and our Sunday morning practices were held here. Very cold and chlorinated - just like I like it! Crrently my ‘indoor pool’ swim suit is a plain black TYR training suit. Lovely tile with lane lines and TORONTO spelled out below me. What is your swimming style? My preference is mostly freestyle – but with some backstroke lengths when possible within a practice. I am also a sprinter as opposed to a distance swimmer – so I prefer to train in sets of shorter, faster intervals than longer distances. How did you get into the water? I dove in from the edge, after waiting a respectable 7 seconds after the swimmer in front of me. I have a love-hate-love relationship with swimming. I was always the kid who dreaded going to swimming lessons, until the moment I got into the pool – then I never wanted to get out. Summers and vacations were spent playing with my little sister in pools and just having fun – doing handstands, holding my breath for as long as I could and ‘flipping’ our hair in fun styles. When we moved to a new town when I was in 7th grade, I tried out for a swim team instead of taking more lessons, not knowing I was getting into a competitive atmosphere. It turned out I wasn’t too bad at it, so I stuck with it. From age 11 to age 18 I moved up the ranks of the club until I was training 9-10 times a week with Olympic hopefuls under a very strong coach who had been with Anne Ottenbrite when she represented Canada at the Olympics in 1984. Swimming took over my life and the practices took over most of my days, but I loved my team mates, I loved going fast in the pool and I wanted to win big one day. I wore my swim coat proudly and was known as ‘the swimmer’ at my high school – who almost always had wet hair. When I was 17 my body started protesting more than the usual sore shoulders – and I started going to a chiro and physio more and more and swimming less and less as I tried to heal. When I was able to go to the pool, I dreaded practice – all it meant was pain and frustration with my self, my coach, and my body. When it was suggested by one of my doctors that my body would not recover while I was still training, and when I was kicked out of one too many practices for being unable to complete a butterfly set, I made the hard decision to leave the sport. In my mid-20s I realized that I really missed swimming and decided to look into masters swim clubs. I found out that the University of Toronto Masters team swam out of the same pool where I spent my Sundays as a kid – and so I signed up and in no time was racing again. I don’t swim 9 times a week anymore (sometimes I am lucky if I get one practice in! ), but it gives my life some balance and the beauty of it is that it’s (mostly) pain and injury free. In 2014 I went to the World Masters Championships in Montreal, QC – which has been the highlight of my ‘adult’ swimming life so far. Whether out at DD Summerville Pool for outside summer practices, or inside at UofT, I feel completely at home in a pool. I am lucky enough to have some great teammates and coaches that make each practice fun and make me feel like I am 16 years old again. I hope I keep swimming and competing for as long as I can – it’s a sport that never gets old and keeps you young. Lindsay Sutherland is a backstroke and freestyle sprinter who swims with TMU, and is a proud member of the TCLES relay team. She also is a proud mom to a 4 year old who just successfully swam a whole lap of his teach pool unassisted! She is most at home in chlorine and most scared of weeds tickling her feet in lakes. I love (LOVE!) swimming, but since having my kid 18 months ago, I've realized how much more complicated it can be to swim with a kid (especially solo). I've learned to strategically pack a bag (towels on the top for quick post-swim-shivering-kid access!) and to make sure there are snacks for both of us to combat the post-swim hangries. Pools with big, wide benches in the change rooms, warm (at least not freezing) water are key, with extra bonus points for super shallow steps/area for littles to splash around in. It's taken me until today to get to this west end gem (and it did open late this season), but I am a convert! There are FOUR (!) pools here: three shallow ones, including a wading pool, wide steps, and a really wide, slow entry for timid swimmers (and a deep end and a twirly slide for big kids). There are even universal change rooms (in addition to men's and women's), and there's stroller parking on deck! The shallow pools are also super warm AND it's even TTC accessible. AND the hours are amazing: M-F 10am-9pm, S/Su 10am-8pm until Labour Day, the THEN there are extra hours from Sept 6-18: M-F 4-7pm and S/Su 12-4pm. So much swimming left! Also, there's an amazing wading pool/splashpad combo nearby (that is open in the afternoon window the pool is closed) and it's near a subway station (and bikeable from my house – extra points). #3: Lambton Kingsway Pool at Dundas W at Prince Edward Dr. This one is a big huge, beautiful pool. The change rooms here are SO great for getting a wriggly toddler in and out of a suit – big benches, lots of space. It gets busy, but there are wide steps that are great for water-timid toddlers to get their feet wet. And after the pool closes for an hour from 4-5, don't take off your kid's suit – just head over to the wading pool in Earlscourt Park. A brilliant summer afternoon! It's not particularly transit friendly, but it's open till 4:15 (which is great post-nap for us!) and there's a huge parking lot. Note: there is a "family change room" though it's nowhere near the pool, and is less a change room than a room with a bench. I love Sunnyside because it's big and huge and always busy. It's right by the lake, with extra points for being beside the dinosaur park and near the Lakeshore Blvd, (and if your kid loves trucks/buses/cars half as much as mine, it makes for entertaining viewing!) It's got wide steps and a ramp in the shallow end. Note: you can't bring bags out on the deck, which can be tricky with littles.